Children today are more stylish (and style-conscious!) than ever. Pinterest is bursting with boards dedicated to kids’ clothing and accessories, while Instagram showcases some of the world’s hippest young fashionistas. Another great way for chic children to express themselves is in their living spaces – bedrooms and playrooms are getting the style treatment, too. Kids’ rooms offer great opportunities for fun, whimsical, theme-based design. Arclin TFL provides the perfect palette: our durable, design-forward surfaces set the stage for wherever your imagination (and that of your young design assistant) might take you. Let’s explore a few trends in children’s decorating to get the creative juices flowing. Most kids have a favorite place – whether this is somewhere down the street or across the globe, you can integrate it into the child’s living space. Zoo-themed rooms, with fun animal prints and representations of their favorite creatures can bring the fun of a trip to the zoo home. A beach bedroom, complete with shell-based decorations or even a lifeguard tower bedframe, makes the ocean available anytime. City-based designs are also popular: a young traveler might want to make their home base a bit more like Paris or New York City. It’s likely that the child for whom you are designing has a favorite color – or maybe a few of them. Kids’ spaces are great places to experiment with fun colors, like blue and green to bring the outdoors inside or soft pastels that make it spring-time year-round. Interesting patterns also offer possibilities – classic stripes, bold polka dots, or chevrons make kids’ spaces pop. 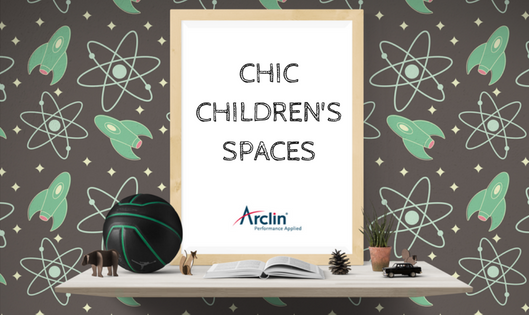 Arclin TFL is the perfect base for your chic, child-friendly design. While style is key, functionality is also essential in rooms for children – Arclin TFL is long-lasting, easy to clean, and affordable when compared to comparable products. But Arclin TFL isn’t just about practicality; it’s also a beautiful framework for your design dreams. An option like Stinson Umber is the perfect underpinning for a woodlands-themed room. Calm Horizon could help create the beach space mentioned above, while beige or black might be the ideal backdrop for some exciting patterns. No matter what design you choose, Arclin TFL provides a stylish, sound place to start.